Notice is hereby given that the Annual General Meeting of the TR Owners Club Ltd (TR Register) will be held on Sunday 25th November 2018; 10.30am registration for 11.00am start. All Directors nominations, resolutions and special resolutions must be submitted in writing sixty days prior to the Annual General Meeting to the TR Register's office or by email to: office@tr-register.co.uk. Whilst legally speaking, no member can be refused entry, seating and lunch will only be provided for those registered to attend. If insufficient numbers are registered before the 15th November for the meeting to be considered quorate, or if an unexpected number of attendees arrive on the day and exceed the safety requirements of the venue, then the AGM is at risk of being postponed. Introduction and welcome including venue health and safety. 1. To receive apologies for absence and introduction. 2. To approve the Minutes of the Annual General Meeting of 5th November 2017. 3. To receive and if considered appropriate adopt the Accounts for the year ended 28th February 2018. 4. To appoint Wellers Accountants, Oxford as the Independent Reviewer of the Accounts. 5. To receive reports from the Directors of the club. 6. To vote on any Honorary membership proposals received (none received). Two words to sum up my period as Chairman if elected, would be 'communication' and 'fun'. I have been a TR4A owner for 39 years and a member of the Register for 20 years. I have made many friendships and enjoyed countless events over that time and as a result, I am enjoying giving something back. I have served on the Board for two years, the last 12 months as Vice-Chairman and since Paul's resignation have been Acting Chairman. My first job was to negotiate the cancellation of the proposed EGM by talking to all involved and finding a sensible middle ground. I have a background in sales negotiation & ran my own Engineering Company for 20 years before recently retiring. Involved in the organisation of the International Weekend in Lincoln 2016 and Malvern 2017, I took the lead role at Lincoln this year. 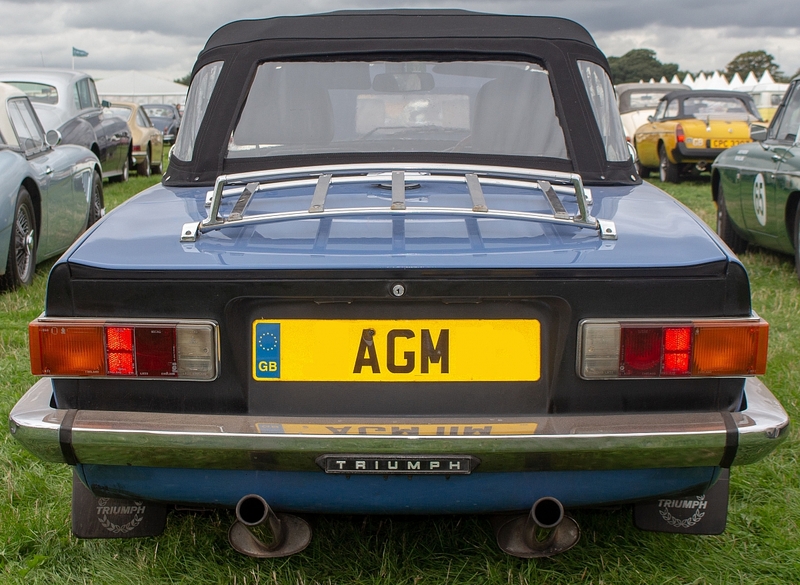 I am already working on next year's 'new look' event at Stratford Racecourse with our friends at the TSSC and Club Triumph, to organise a joint weekend bringing the Triumph community closer together. I firmly believe that the future of our club is brighter with inter-club co-operation. There are significant challenges around the supply of TR7 parts and a wider issue of parts quality for all TRs creating a golden opportunity for the SDF to make a real difference. I would look for a way for them to become an actively supported part of the club once again. Directors have a duty to listen to members and communicate both more often and more openly. As Chairman, communication for me, would always be a priority and I have arranged that all Management Team minutes will be published in TR Action. I will not allow a Team under my chairmanship to operate in a bubble, separated from the membership. The Management Team must operate professionally but must also ensure that club life is exciting, engaging and 'fun' by working with local Groups to offer a variety of events and activities that appeal to all members and their families. As Chairman, I would work to ensure that we do not lose sight of what the TR Register is here to provide - support, friendship and fun for TR owners around the world. I have the experience, proven track record and commitment to take the TR Register forward for the benefit of all members and I sincerely hope you will offer me your support to allow me to do that. Proposed by: Mark Ockenden. Seconded by: Bob Cornwell. London Group member since the mid 90's. I'm a retired aerospace engineer. 43 years at BEA/British Airways mainly in the Non-Destructive testing department; closely allied with the quality department. 1. Keeping the Board under control and allowing the Board to control. Having the correct Policies, Procedures and Protocols in place to allow functionality of the Board. Events over too long a period suggest that this area has not been supported too well and the tools for doing the job are no longer adequate. 2. Allowing the club to grow by allowing the members more say. This may not be easy but at the end of the day it is the member's club. The International Week End has diminished from the grand events of the 1990's and 2000's. I want to re-invigorate the IWE so that it is once again a pleasure to attend. Hard job, but one worth doing in my mind. People talk about change being inevitable. That may be so, but it must be a constructive change. One that gives benefit. How will the jobs be done? A few years back I was a scout leader and the only way to run a decent Scout troop is to get the members involved. In our case, with the TRR, that means the GL's downwards. Many of you will remember that I stood and was elected in 2016 as the Deputy Chairman. I failed. I had a serious disagreement with certain members of the board. Walking away was a very bad move. Not very professional. Over the last two years I've learnt a great deal in human nature and self-control. If you decide to put your trust in me I will not let you down. A 63-year-old civil engineer who for 45 of those years has worked the length and breadth of the UK as a Senior Project Manager. I am now a Director and co-own a £40m structural repair business with 8 other owners. We purchased the company in 2005 from Gleeson Civil engineering via a management buyout. I sit on several committees at executive level and have been Chairman of the trade association. I live in the Derbyshire Peak District with my wife, the offspring have flown the nest. My motoring interest started at a very early age as my brother who is ten years older than I, always had a spanner in is hand and a younger brother looking over his shoulder. Our father spent the whole of his working life as an engineer in the steel making business. Self-car maintenance was a given in the family. My father navigated big brother in his motor rally career by the time I started in motor sport dad had had enough and I had to find my own map man. However, I had a successful motor sport career at local level throughout the Seventies and early Eighties. Mortgages and children soon put an end to it. I now find myself free of both and with time to indulge myself in interesting motorcars once again. You could say that I'm somewhat of a gregarious character, an essential trait if you are to survive as a senior manager on major Civil Engineering schemes. I therefore believe I'm a good candidate to represent the TR Register as its Vice Chairman and to represent the local groups as East Midlands Director. I understand the need for excellent communication and to deliver that communication in both directions; to listen to and understand members' needs and ensure that those needs are heard at committee and dealt with in an appropriate manner with the outcome communicated back to the members and groups. But let's not forget that this is a car club, it's for our enjoyment and it's our hobby let's not get hung up by bureaucratic nonsense. I would like to help streamline our car club for it to become the most enjoyable thing that we all do and for it to become the envy of all car clubs. I have been a member of TRR continuously since I bought my TR4 in 1974. I qualified as a Chartered Accountant in 1978 and as a Chartered Tax Advisor in 1982. In 1988 bought my own accountancy practice. The business was involved in accounts production and review, business tax, personal tax, VAT, business planning, book keeping, and payroll for clients etc. In 2003 1 merged with a larger firm and became an equal partner. I managed a portfolio of slightly larger clients and was able to develop more of an advisory/consultancy role. I retired from the practice in 2015. Whist a sole practitioner I advised a group who were looking to set up a new engineering business and was invited to join them as Finance Director. We set up the company in 1993 to remanufacture steering and related components for the bus and coach industry. The company is still trading, and I oversee the accounts function, process director's PAYE and look after pensions auto enrolment etc. as well as preparing annual accounts and supporting the other 3 directors. I am therefore experienced in both the practical aspects of accounts production and in the preparation of budgets, forecasts and cash flow projections as well as in the strategic importance of sound financial management. Having undertaken the Finance Director role (albeit on a part time basis) in the small engineering company I am happy to work as part of a team of directors. I believe that the published accounts of the TR Register can be more informative to the membership and that I can provide financial information, advice and support to the rest of the board. I have a sound knowledge of the Companies Act and am keen to become involved in a review and revision of the club's Articles of Association. Having had my TR6 for 38 years and my TR3 for 6 years if felt that it was about time I did something extra for the club so, having already been a Group Leader, I volunteered for the role of International Director and was first elected in 2016. So, after two years on the board, why am I standing again? A glutton for punishment, or do I still have more to give? I really like dealing with the many International clubs and members I have had contact with around the world. I get up to 10 emails per week from either international clubs, members or UK members looking for help. I answer all of them from my own knowledge or seek help from somebody who can answer their questions or help them. It has been another very busy year attending a number of car shows and events representing the club. In June, as TR Tours, Linda and I led 26 TRs on a tour to the Spanish Pyrenees, a fantastic adventure, as you can read in TR Action. In September, a large UK contingent attended the 2018 European Meeting in Germany. It is great to see new people joining in these events and using their TRs for continental touring, but it takes a lot of work and months of planning to put these together, as you can imagine. Feedback is excellent, so more tours and events are already planned for 2019. TR Tours are hoping to go to the Ardennes in June and Scotland in early September. The European Meeting is being held in Pamplona, Spain in late September 2019. All events will be advertised on the website and in TR Action. Plans are coming together for the European Meeting in 2020 which the TR Register will host here in the UK. The main weekend for up to 350 people from across Europe will be based at the Chesford Grange Hotel in Warwickshire. A 4-night tour for up to 140 people will be based in the Metropole Hotel, Llandrindod Wells. All hotels and major event venues are now booked and contracted. It is a major undertaking by the club and I am leading an experienced team to manage this event. Work on the board has been very challenging with some significant issues to investigate and resolve. l attended all but one board meeting during the year and have volunteered to take on additional responsibilities where I can. believe I have acted with honesty and integrity in all aspects of the board. I take my responsibilities to all members seriously. I have 35 years international business experience as a senior manager for a FTSE 100 company and have lived and worked in three countries outside the UK. I have been a Director of two companies, one in France and one in Hong Kong, both related to the above UK company. For the immediate future I would like to continue in the role to finish organising the Euromeet 2020 and to deliver an event that we can all be proud of. I believe I have made steps to make touring more accessible to a wider group of members but there is more to do. I would wish to foster better relationships with the 430 individual International members and all the 35 associated Triumph or TR clubs around the world. Proposed by: William Pollock. Seconded by: Richard Larter. 1971 - Purchased my first TR, TR3 registration number 2999F, which I still own. 1973 to 1975 - Founding member of the Clyde Valley Group. 1981 - Reformed the Clyde Valley Group which ceased to function and started competing in Hillclimbs. 1983 to 1986 - First Scottish Co-Ordinator of the TR Register. During this time the TR Register Scottish Weekend was established, together with a TR specific class in the Scottish Hillclimb Championship. 1985 - Responsible for the inception of and Co-Ordinator of the Doune Classic Weekend, which morphed from the TR Register Scottish Weekend. 2008 - Resumed competing in Hillclimbs. 2014 - Resurrected the TR Register Scottish Weekend, held in association with the Bo'ness Revival. Joined the Board of the Bo'ness Revival which encompasses activities associated with organising the Revival Hillclimb, in addition to being Co-Ordinator of the Revival Classic. 2017 - Vice Chairman of the Bo'ness Revival. 2018 - Responsible for the inception of Scottish Triumph Weekend as part of the Revival Classic, which saw just over 100 -Triumphs from the major Triumph Clubs, as part of the overall total of 430-entrants from 34-classic clubs. I have been a member of the TR continually since 1992. In 2009 I was elected as Group Leader for the Derbyshire Dales Group, succeeding Alan Wilkinson. At that time the group was in a perilous position having a few stalwarts left and the meetings sparsely attended. The group was on the verge of collapse mainly due to inertia and general apathy. In my five years as Group Leader I transformed the group into a vibrant, busy section having runs, group lunches etc and culminating in 20I2 of the Derbyshire Dales group being awarded the coveted 'Wheelspinners' award as best group of the year. The citation at the time enumerated the list of activities now enjoyed by members. I stepped down from the Group Leaders position in 20I4 feeling that I had done my 'watch' and others needed to be involved. I have not since been without duties, for the past 12 years I have run the Derbyshire Dales Weekend, next year being obliged to move to the Palace Hotel in Buxton due the popularity of the event. In 2005 I was awarded the TR Register Gold Award for my compilation of the European Breakdown Directory, this was followed in 2013 by the Clubman's Award for taking over the first Winter Ball at the Casa Chesterfield due to Chris Hale's incapacity. I have attended many weekend events over the years and have only missed one European meeting in the last 20 years. As will be seen from the above, I'm well known around the TR scene and look forward to being of service in this wider role. After spending my whole working life in the Automobile Industry, firstly on Engine Test where I finished as Supervisor over some 120 personnel until Leyland Motors closed engine manufacture. I then continued as Quality Assurance Manager at the largest privately-owned pressing company in Lancashire producing body panels for most major manufactures in Europe including Ford, Volkswagen, Saab and Opel. After the years of being involved in the motor industry, I am aware of the problems members have with the quality of some parts available for our cars having owned two TR7s, I now own a TR6, and at present, I am rebuilding a TR2. With the way, the motor industry works the main concern will continue to be body panels. By the end of a production run of a model the press tools in many cases will be scrapped (tool steel is very expensive even as scrap), although some may be sold to an outside supplier, most will have reached very near the end of their working life and refurbishment would be an enormous cost. As to my experience in the TR Register, I enjoyed 7 years as GL of the largest group in the country Red Rose, from which I stepped down nearly 2 years ago. During my time as GL I was responsible for organizing many events including 3 by-annual Coast to Coast weekends from the West to East Coast, the Oulton Park Gold Cup weekends, which this year saw 5 Groups involved, Red Rose, Cumbria, Stoke, Shropshire and North Wales, some 85 cars plus I from East Riding. Treasurer and more Area Co-ordinators is the correct way to give the members more say through their representatives. Having studied Bsc Hons Computer Science at Portsmouth I needed a car for work. TR's caught my eye and a life-long interest in Triumphs continued from my Grandfather's Standard Pennant which I still own and my mum's Triumph 1300. A chance meeting at Fleet Services, Ian Evans advised joining TR Register in 1976 before purchasing my TR4A, attending Wessex group regularly hence standing on their Events & Newsletter Committee. Subsequently while representative for Candy I factored being Southern Co-ordinator around my work schedule reducing expenses, persuading Mark Treadwell, a younger keen member, to become South East Co-ordinator. Marrying Alec, moving West with a young family TR-ing became unaffordable. Alec stood in the same role later hence I attended local group meetings and discussed Committee matters — including formation of the Limited by Guarantee Company as the then situation could backfire on our own finances. I supported Alec with negotiations regarding Group problems outside of his area. My beloved TR4A sat quietly in the garage usurped by my road going TR7V8 and Drag cars. Alec's cancer spurred him into having her restored. Now a beautiful rolling chassis thanks to Jeff Leat - TR6 owner, Wensum and Trent members. Located at the edge of Salisbury Plain equidistant to my local Apple County Group and Wessex but closer to Dorset Group. However, South-Central or South West suits the road networks and traffic for evening and weekend runs and not wishing to be Co-ordinator for my local group. Liaison with other car clubs particularly those with younger demographics to achieve a larger and more vibrant interest in TRS encouraging diversity in our membership as multi car insurance policies allow for many marques within one family group. I fully support a smaller Board of Directors with knowledge of Company Law with a committee running a Car Club. I have been a TR Register member since 1979 and a committee member since 1989. I currently own 2 TRs (TR2 & TR4A) and have owned a number of TR7s. Over the years I have been Group Leader of 2 local groups, have been involved in many shows and have organised the TR Register Lakes Tour for many years. The position I wish to stand for is Midlands Area Director. As many of you will know, I attend many events and keep in close contact with Group leaders and members in the region in order to reflect their needs at board level. I have attended the majority of committee/Board meetings and have assisted in putting together a TR Register stand at many shows in the region. I have been retired some years following a career in the Aerospace industry and am currently Finance Director/Trustee for a charity, which owns/runs a hotel in Derbyshire. This is a part time unpaid role. I look forward to using my knowledge and experience in assisting the TR Register to move forward with some new faces on the board and of course driving my TR to many TR Register events. Proposed by: Peter Bowden. Seconded by: Mike Ellis (TR2/3 Registrar). I am also a Registrar, collating, keeping records, technicalities of the Grinnall marque. In this role I would also be willing to represent Registrars on the Board, something that's been requested for a long time. I have been a member of the TR Register 18+ years, purchasing my first TR, a TR250 at IWE 2000, have always had a strong interest in cars, motorsports since my teenage. As a member, I have been involved with the Kennet Valley Committee since 2004, have held various roles and now Group Leader into my 9th year. Since my tenure, the attending membership and partners has increased from mid-twenties to mid-thirties plus. I am very hands on, have a good committee and working relationship, striving to offer members every opportunity to enjoy their TR's, regular communication, written, verbal at meetings, attending events local & national, strong use of the website, winning an award at the AGM for the best club site, also regular liaison with local Groups to bring more inter-group events and promote a one club atmosphere. My skills, I started my career as an electrician, running contracts, then a change of direction moving into sales, progressing from Area Sales to Sales Director, but after 23 years took another leap joining a French company at which I am now Commercial Director managing a global sales team, a Board member reporting direct to the CEO and Owner and also partial share holder developing my business acumen and skills. What I bring to this role, is my continued tenacity, coordination, experience and enthusiasm for the TR Register and marques, especially developing ideas, communicating, coordinating events to ensure all local members gets the most out of their TR and to supporting GL's in their areas, to develop their clubs for all members benefit and fun. I have been a member of the TR Register since 1975 and have owned my Conifer Green TR4 for the past 44 years. In 1991, I purchased a very early TR3 which was a 'barn find' requiring a ground up restoration which I completed primarily myself over the following 5 years. Both cars are in regular use and my wife, Lesley and I frequently participate in TRR and local Group events both in the UK and continental Europe. We began our membership of the TRR as members of Chiltern Group where we were active for several years. Following a house move we transferred to Windsor Forest TRs in 1995. In 2012, I was elected Group Leader, a position I have now held for 6 years. During this time WF has seen many developments and with the assistance of its Committee seen significant growth in its active membership base. In 2014 the Group won the Wheel Spinner Award as the most improved group. Based on this experience I was a nominee for Chairman of the TR Register at the AGM in 2016 but on the day was beaten into third place by Paul Hogan and Allan Westbury. Since then I have been SE Coordinator although the role has been very limited in scope as it is not directly represented on the Board. In my view a key aspect of the TRR that has been missing in recent years is regular and effective two way communication from the Board to members and groups. Feedback and a willingness to listen is a key factor in the success of any organisation and in recent months we have seen conflict in our Club due primarily, in my view, to a lack of a common understanding of the aims, objectives and actions of the Board and the lack of trust this can cause. The new position of SE Director offers much more opportunity to support the groups in my local area. My aim would be to improve communications and to influence the direction of the Register to the benefit of members. I have been a very active TR Register Wensum Group member since I joined in 1984 helping organise and initiating events soon after I joined. I became Wensum Group Leader in 2002 after being the events Coordinator for many years. I have close ties with the other East TR groups, the Norfolk Stag owners club and Norfolk Triumph sporting six club organising joint events with them. I have organised events for visiting TR groups such as the Dutch TR group, TR Youth group, North London TR group and my own Wensum TR groups 40th Anniversary for 130 people. I have encouraged and taken my group and members of other TR groups to many overseas and national events, such as, Angouleme Circuit Des Ramparts, Le Mans 24 hr, and Le Man Classic, Spa Classic, TR European meeting in Holland and TR internationals. This year I organised a very successful East Area TR group social meeting at The Royal George Inn near Thetford. I presently own two TRs a TR 5 and TR 4A that I use extensively for overseas holidays and driving on racetracks, to showing at static events, I try to encourage my members to enjoy the ownership of their cars for whatever purpose they desire. I think my experience over my 34 years of membership will help me assist the East groups and the TR Register management team in the future. My association with Triumphs goes back to my late teens and as I am now retired it is a lot of years since my first TR holiday in 1971. Marriage and children kept me away from classic cars until 1988 when I bought a Mayflower, (finances would not allow a TR at the time) I showed that extensively enjoying many concours wins and eventually becoming Chairman of the club to which, I still enjoy an Honorary membership. My TR6 came in 2003, I joined the TR Register and North London Group and a year later became the Group Leader for the next 10 years enjoying the role to the full, expanding our horizons and our NLG membership. Travelling abroad in your TR soon became the thing to do and so I was part of the organising team which took many members to Classic Le mans and Spa, in the first year creating the sea of Red shirts which was a great success. It is gratifying when at club events and the International weekend to see the polo shirts from those trips abroad still being worn as a badge of honour. A short spell on the Board of Directors found me to be the Lead for the first Lincoln International Weekend, after a brief of, "go and find a new venue for the international Weekend " so I did just that. In recent years there has been a perceived distancing of the Board of Directors and while looking to the future of the TR Register with my firm belief that contact must be maintained to ensure harmony throughout the club to the ordinary members I hope to be able fulfil the role of Area Director with enthusiasm and personal contact with every group in my area. TRavel safe and have fun, see you there! 8. To fix the current rates of subscription at current levels for the next 12 months. 9.1. Chairman to have a vote at Directors board meetings. Proposed amendment to clause 12 of the Articles of Association - Chairing Directors meetings. (1) Subject to 12 (2) below, The Club Chairman or Chairman of the Meeting shall chair the directors' meetings and shall have a vote at the meeting. In the case of a tied vote the Chairman's vote shall be considered the casting vote. (2) The quorum for director's meetings may be fixed from time to time by a decision of the Directors, but it must never be less than five and unless otherwise fixed it is five. 9.2. Proposed new clauses 17(4 & 5) regarding the election & maximum term of office for the Chairman. 17 (4) The Chairman to have served on the board for the preceding year before election. 17(5) The Chairman's term to be time limited to three years unless there are no other candidates in which case he can stand for a maximum of a further two years. 9.3. A requirement for all Directors to undergo a Disclosure & Barring Service check. 17(6) All Directors must undergo a suitable disclosure check. (1) There shall be not less than 5 or more than 25 directors of the Club and they shall be elected by vote at the AGM. (2) The directors shall consist of the Club Chairman, a vice-chairman and a finance director and not less than two others. (3) Available directorships shall be notified by the directors prior to the nomination deadline for the AGM but the directors must not include more than three directorships without portfolio. (5) The chairman can only stand for three consecutive years and then must stand down. Thereafter, if there are no nominations for chairman the incumbent may stand for election up to a maximum of a further two years. (7) Notice of available directorships may be accompanied by a reasonably detailed job description of the role concerned. 9.4. To introduce an independent review before any member can be suspended or expelled from the club. To replace the existing clause 23(5) with the following proposed Article 23(5). Directors have the power to suspend or expel members under the following conditions. (a) If a member has been reported to a Director to be acting in a way harmful to the interests of the Club, then, if the reports are considered to be of substance, the Directors will call for an independent and confidential review by three independent members who will examine the issue from all aspects, compile a report and make a recommendation to the Directors. (b) If the recommendation of the review is for suspension or expulsion, the member will be given at least 14 clear days of notice that such a resolution is to be proposed, specifying the allegations and given a copy of the review report, in confidence. (c) The member will then be given reasonable opportunity of being heard by, or of making written representations to, the Directors. (d) The final decision, (based upon the recommendation but reflecting the member's representations) will be made at a meeting of Directors which must have at least half of the total serving Directors present. To be added to the Articles of Association under the heading of 'Directors' Clause 16. Each nominee/director will be voted into office at every AGM. Tenure shall be limited to a maximum of five (5) years, whether consecutive or part thereof. The five (5) year tenure may comprise of different posts. An extension of one (1) year may be permitted where a shortage of candidates is foreseen. Three (3) years must elapse before an individual may be elected to a further period of office, which would be subject to this same five (5) year limitation. the addition of this Article. This could seriously limit the availability of suitable candidates. All directors stand for election every year anyway. 20 - The club may pay any reasonable expenses which the directors properly incur in the performance of their duties which will be declared at the following AGM together with the amount of such expenses. Insert - These expenses will be declared for each director in an itemised format (cost & reason) at the following AGM. Amendment to clause 6 (4) of the TRR Articles of Association. b) All vacancies for such co-opted roles are advertised internally within the TR Register, inviting individuals with suitable skills and experiences to apply, with interviews if necessary prior to selection. c) If a "director" is co-opted, they do not have board voting rights. Such voting rights are acquired when elected by the membership to the role at an AGM or EGM. However, the co-opted director can vote to enact an AGM/EGM. Directors need to be able to co-opt suitable candidates for any position and the co-opted director should be an equal member of the Management Team with full voting rights. At the next AGM the co-opted Director has to stand for re-election anyway. Remove: "Any Member of the Club shall be entitled to inspect the books and records of the Club at the Club address during normal business hours by giving seven days' notice in writing." Replace with: "Any Member of the Club shall be entitled to inspect the books and records of the Club by giving seven days' notice in writing. Such records will include board meeting minutes and all discussions undertaken on the directors' forum. Books and records will be available to view at the Club's address, or upon request will be sent electronically to the member making the request." Members already have the right to inspect the accounts. Employees have a right for their salaries and other personal details to remain confidential. The Directors also need an area to discuss confidential matters. If the Director's forum was made open to all, it would negate its purpose. 9.9 The adoption of new Forum Rules for all users and members. It is my belief that the current rules for users on the TR Register Forum are not fit for purpose. They do not offer detailed enough guidance for what is expected of users, do not assist the moderators sufficiently and crucially, are not effective at protecting the TR Register and its Forum from abuse and misuse. Therefore, what is needed is a more explicit set of rules that are published on the Forum, constantly updated and every user made to agree to abide by them whilst using the Forum. I would like to see these rules ratified by the wider membership of the club, not just the board of Directors or Forum regulars alone and so propose them for adoption at the Annual General Meeting by means of a Resolution. I therefore propose the adoption, implementation and enforcement of the attached Forum Rules . The rules have been drafted following lengthy research into what other car clubs have in place, such as Porsche Club GB and the Jaguar Enthusiasts Club and have been adapted for use by the TR Register. This measure is much needed with urgency. 9.10 To create a new forum within the 'TR Register Technical Forum' titled Alec's Inn. Alec Pringle was an advocate of free speech. 'Alec's Inn' would be open all hours to all TRR members and non-members to discuss any and every topic subject to the rules and conditions of the Forum. The forum rules and moderators' actions will be adhered to by all users. The alternative 'members chat' area is a secure forum for serious matters and only accessible to TRR members. This is not an appropriate forum for casual topics. Whilst the Directors are supportive of the sentiment behind dedicating an area of the forum to the memory of a valued member, the suggested purpose of this Forum should be within a members' only area and must align with the rules proposed to this meeting by the membership. 10. To transact any other business that may be properly brought before the meeting and of which due notice has been given. Following the close of official business, Honorary President Graham Robson and Wayne Scott will present the TR Register Annual Awards, Don't forget you can nominate someone you know in the club, for more details visit: www.tr-register.co.uk/agm/awards or email your nomination to: press@tr-register.co.uk . Proxy Voting will be held in accordance with the Companies Act 2006 and will open on October 25th 2018 at 11am. In the event a member is unable to attend they can register their proxy either specifically or non-specifically with the chairman or an attending member by registering below. The deadline for Proxy Voting is 11am on Friday 23rd November 2018 (48 hours before the meeting). When deciding how you wish your proxy to vote the following form should be used in conjunction with the material published below. Please take time to read all the material corresponding to each nomination and resolution. On submission, the form will be entered into our digital proxy database and an automated email issued to your registered proxy instructing them how to vote. These records will also be retained by the office. IMPORTANT:If you are unable to attend and do not know anyone planning to attend, then you may assign your proxy vote to the Chairman of the meeting to vote on your behalf either at the Chairman's discretion or as you specifically instruct him below. These votes will be handled by the proxy officer. The Acting Chairman on the TR Register, Allan Westbury will be calling a poll on all resolutions and any contested Directors' posts, so all proxy votes will be counted for those items. Abstentions will not be counted.